The Prep environment provides a warm, nurturing domestic surrounding as much as possible. Colours, furnishings and materials are chosen with care and for specific qualities. The soft shades of pink are used to decorate the room in the early years to create a sense of calm, warmth and nurturing for the young child. The room will always include a seasonal table that is carefully and beautifully decorated to reflect the qualities of the season. This is where children also contribute their nature treasures and add to the beauty of the table. Natural materials and play things from the natural world are used wherever possible. 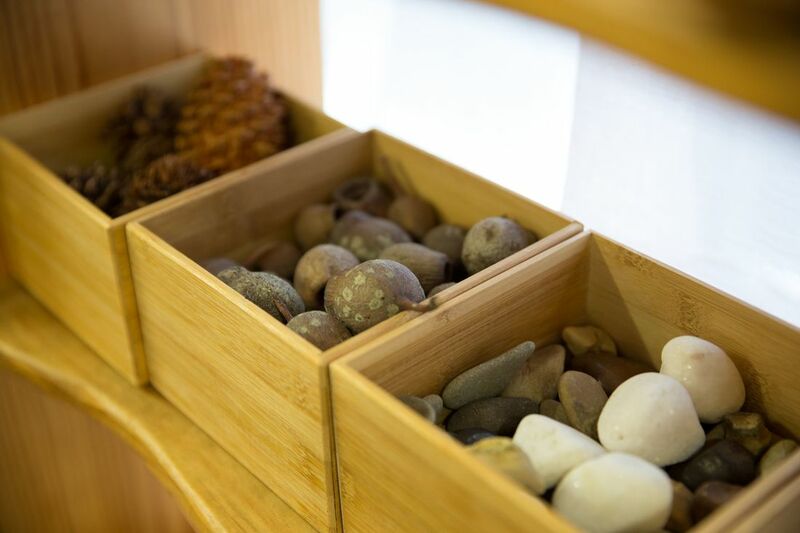 Baskets of wooden blocks, shells, stones, crystals and feathers all support creative play. Cloths of all sizes and colours are used for dress ups, cubbies, story scenes and more. Play stands, tables and chairs are used to create ships, castles, buses, trains, tractors, or even stages for performances, as play requires. Early learning is profoundly connected to the child’s own physical body and sensory experience. Everything the young child sees, hears, and touches has an effect. Thus a clean, orderly, beautiful, quiet setting is essential. The use of material that is soft coloured and of natural fibres, such as curtains, helps to create a sense of safety as the children are cocooned in the class. The teacher, in integrating diverse elements into a harmonious and meaningful environment, provides surroundings that are accessible to the child’s understanding, feeling, and active will. The care, love, and intention expressed through the outer materials and furnishings of the classes are experienced unconsciously by the child. The use of natural materials as counters and handmade playthings contribute to the feel or richness of the learning environment. Sheepskins- parents are given the option of providing a sheepskin or a rug for children to sit on. This provides comfort and nurturing when at their desks and is also used on the floor for rest time, meditation and story-telling. The use of a blackboard and chalk by the teacher, (like the use of beeswax crayons for the child) give an aesthetically pleasing image for all and allows the students to see the teacher modelling ‘having a go at being an artist’ if drawing is not one of their strengths. This encourages the children to ‘have a go’. Visual aids- these are valued as one of many ways children learn. Visual aids are generally made by the teacher or have an artistic quality to them. They are kept to a minimum and are often rotated so that the children still notice them. Children need a place for their eyes to rest, so the less busy the walls of the room, the better. Cane baskets/wooden boxes for storage help create a visually softer and more homely feel to the room. Nature/seasons table- create a focus for what is happening in the immediate external environment around them. Musical instruments- lyres, xylophones, gas drums, ukuleles, guitars and percussion instruments are used by teachers as a support to multi-model learning as well as general classroom management (e.g. getting children’s attention). We adorn the Class 3 classroom in yellow. We use muslin, cotton, silk and natural fabrics. The teachers have generally strived to build up the classrooms often with their own time and effort. The atmosphere of the room is often complemented visually with resources and/or work samples that reflect the theme of the current main lesson. A nature table can bring a point of focus for story-time, particularly for the busy minds. The select use of materials can connect our learning space and students’ imaginations with nature. Fabrics and routines engender a sense of reverence and respect for our classroom, the world around us and of course for each other. The choice of natural over synthetic gives the message that our earth is beautiful, resource, worthwhile and worth protecting.